Published on 16th Dec. - With steady and confident steps the three ladies entered the room among a very welcoming standing ovation. The three magnificent and inspiring ladies, the Nobel Peace Prize Laureates for 2011, President Ellen Johnson Sirleaf of Liberia, Leymah Gbowee, a Liberian social worker and peace activist, and Tawakul Karman, a Yemeni journalist and a political activist who broke the record and became at age 32 the youngest Peace Prize Laureate and the first Arab woman to receive the award. They were hosted in a special seminar and dinner by the Sweden Foreign Ministry in Stockholm, last Monday Dec. 12, 2011. With the presence of high ranking Swedish diplomats and big Swedish social public figures, the seminar raised discussions that were very gripping. Mainly, what seemed to be a gathering to celebrate the laureates’ award, turned to be a platform where the laureates sent strong messages to the international community about misconceptions related to international development work in Africa and the perception of Islam. Additionally, there was a final element of surprise after one of the laureates announced her willingness to run for presidential elections. One has to admit though, the three laureates were not fully combined by feminism. They all were political activists but not feminists. For the Liberian ladies, it was apparent how they’ve been fighting for social change through peace building from a feministic approach. Whereas, Karman had never used or stated that her approach to fight for reforms and calling for political rights were from a feminist approach. 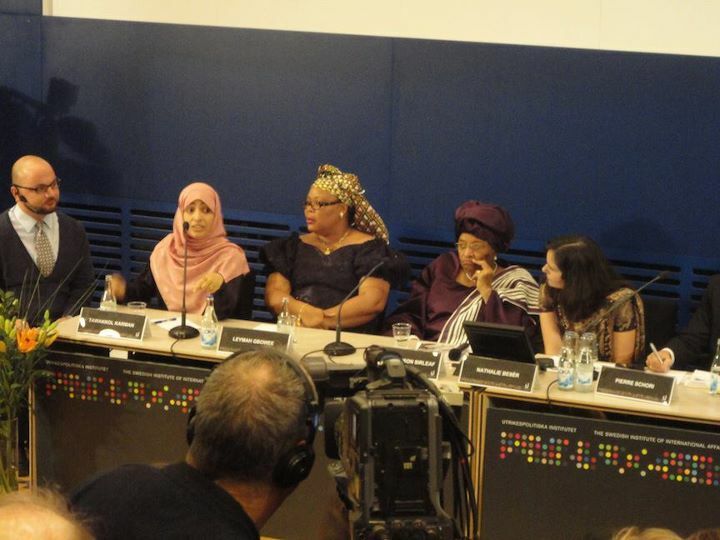 In fact, Tawakul has stated that she was not a feminist activist. She was a political activist from day one and she would always be. She mainly focuses on advocacy for freedom of press and democracy. Nevertheless, Karman has come a long way in exerting her efforts to fight corruption and violations against press freedom. In that path, she has endured a lot. Karman has been putting her life in danger for over five years. She has been jailed periodically; arrested and threatened a number of times by the government. Danger was not only against her. 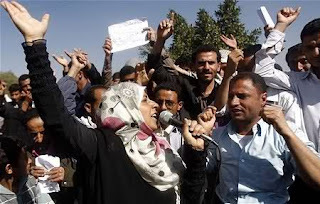 In June 2011, her brother, poet Tareq Karman, was kidnapped in Taiz province by an armed group and released afterwards after sending death threats through him to Tawakul. It was obvious how powerful and strong were those ladies. Their bravery and high spirits made them among the only 15 women who were awarded the Nobel Peace Prize of the 101 individuals awarded the Prize over history. Karman was repeatedly asked if Islamization would interfere with democracy, freedom of expression and women’s rights. She was also asked if political Islam would form a hazard to the future in Yemen and the Middle East. “Islam is a religion of peace to all the people; men and women and it has never been and would never be problematic for anyone. I must say that I feel I’m here not to celebrate the award but to defend my religion. I really object,” she was commenting on the questions related to Islam. 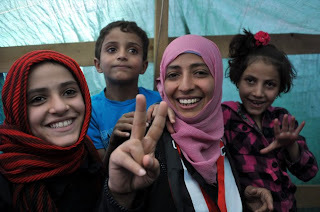 Karman’s active effort comes as part of the great role Yemeni women have always played in the county’s development. Unfortunately, women in Yemen could have been more empowered and influential but due to the unjust regime of Saleh; women’s rights have been snatched from them. 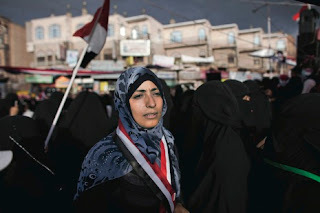 Yet, for almost the past 10 years, Yemen witnessed other hard-core feminist ladies; to name few; like the late Dr. Raufa Hassan, Yemen’s first female journalist, Amal Al-Alim Soswa, first female ambassador, Amal Al-Basha, human rights activist and author Arwa Othman. Karman’s efforts in fighting corruption and injustice didn’t begin with the Arab spring. She has been an active political activist, a campaigner for political prisoners and a regular organizer of demonstrations for a long time. She led around 110 sit-in demonstrations in front of Parliament and Ministry of Information since 2005. Her tireless and continuous effort for change and reforms was outstanding. With the prize, Karman was not only the first Arab woman to win, but also the youngest person ever to become a Nobel Peace laureate. While she became internationally acclaimed, she still gets criticism and hate comments. There has been a clip circulated where her father scolded her in a parliament session. Others called her superficial and unqualified for the prize. In light of that, she has mentioned many times that the prize was not for her; it was for all of Yemen and its struggle for change and democracy. Refusing to let anything or anyone to demoralize her, since her winning announcement, she became increasingly involved in mobilizing world opinion and United Nations Security Council members to assist the protesters in ousting Saleh and bringing him before the International Court. Karman has been clear on her stance that Saleh must be prosecuted and all his assets must be frozen by the international community. In the pursuit to make that come true, Tawakul continues to lead the uprising armed with peaceful struggle and a plan to run for presidential elections on February 21.